Arriving at this design felt effortless — like watching a Brazil goal. Obvious, inevitable, and with a bit of an artistic flourish. Before doing any research on Brazil, which we have some familiarity with, our inspiration was already established: the sidewalks. 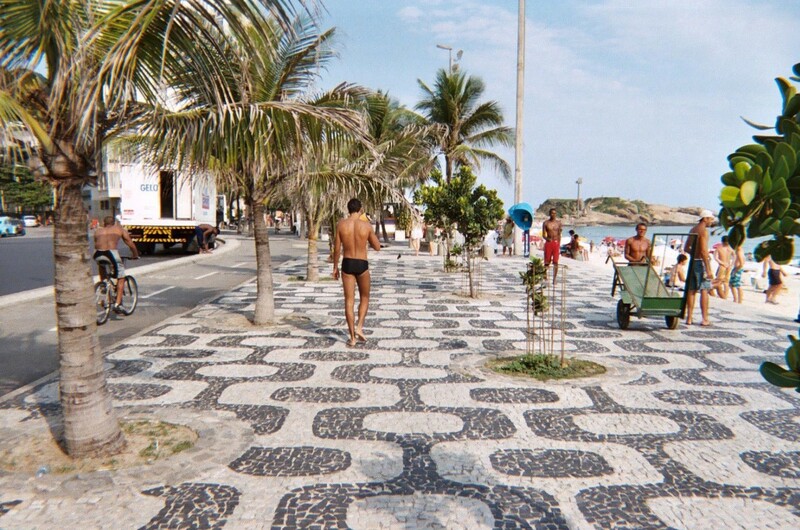 If you’ve ever been to Brazil, or even seen pictures of any Brazilian city, you may have keyed in on the gorgeous black-and-white mosiac sidewalks. It’s not just that the sidewalks are beautiful; it’s not just that they’re geometrically perfect. It’s that there are miles of them, repeating patterns stretching for days along beaches and thoroughfares. Each repeating section has been painstakingly constructed with small black and white stones. These sidewalks actually date back to Brazil’s ancestral forebearers, the Portuguese. Their sidewalks are a derivative of Portuguese pavement, the art of depicting realistic images and whole murals along city streets. Brazil’s pavement designs are more abstract — more Brazillian, in a way — and seem to follow a small set of basic motifs. For our insiration, we chose the pattern that recurs most famously along the Ipanema beach in Rio de Janeiro. 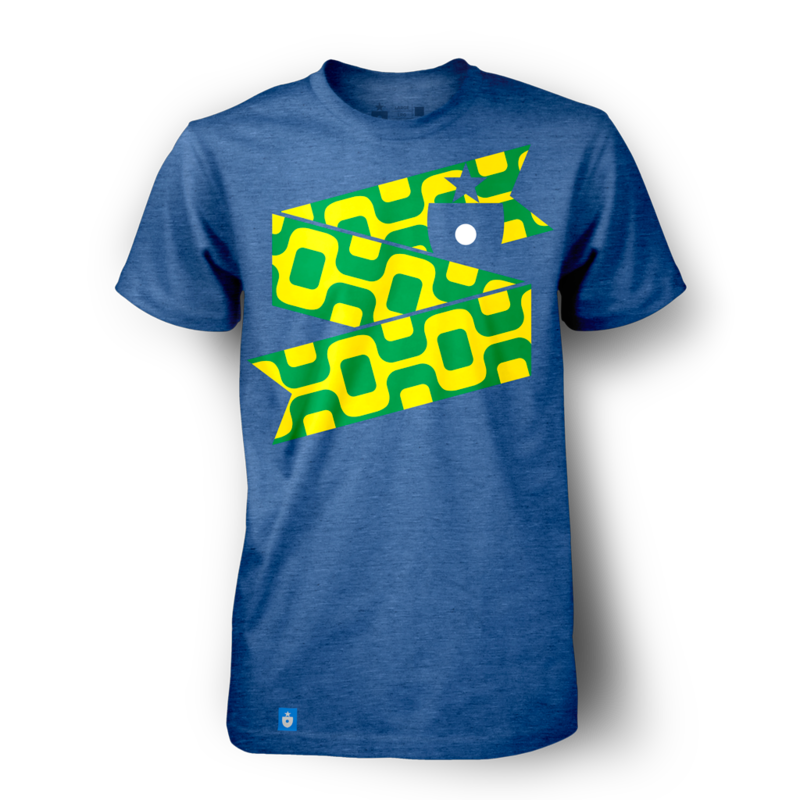 The Brazil Shirt, by Clean Sheet Co. 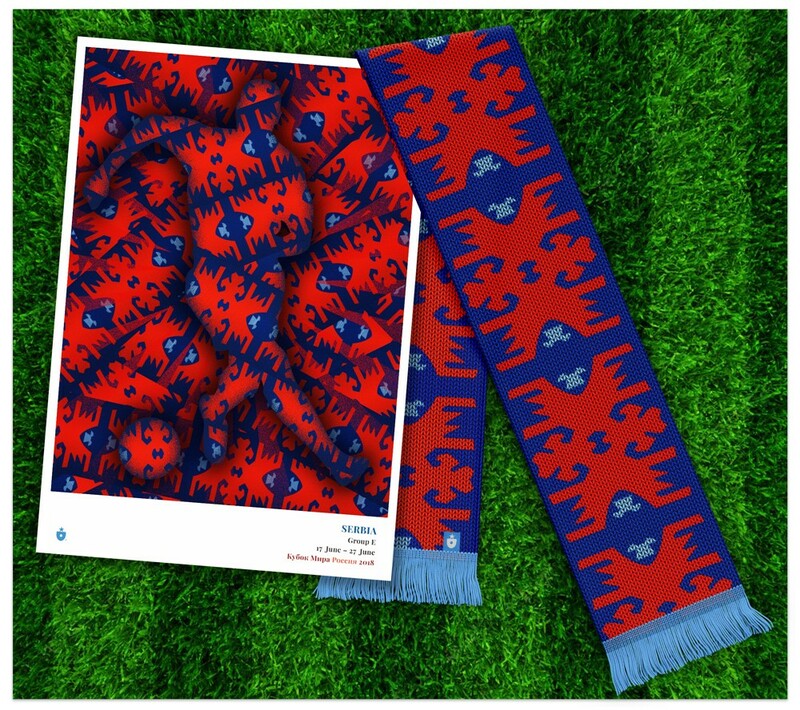 The pattern looks beautiful overlapping (via our poster design) or standing alone (on, say, a scarf). 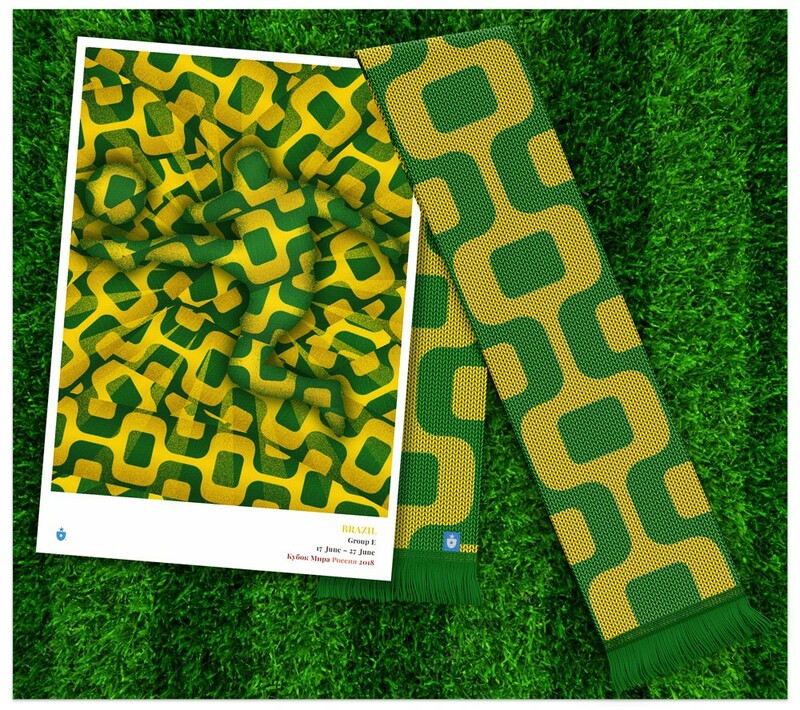 The Brazil poster & scarf. Though there are countless miles already in place, the future of Brazil’s distinctive pavement seems worrisome. Wikipedia states that “very little new paving is done and the entire profession is at risk. The long hours and low wages typical of calceteiros have reduced apprenticeships and thus new pavers.” We’re happy to document and celebrate Brazil’s beautiful paving tradition with this design. Like the play of the national team, there’s an interconnected rhythm to the pavement that makes it irresistable. We showed you this one a bit early — using it as a demo, in fact, for the entire project. Why? Because no national identity is so perfectly depicted by a simple symbol as is Switzerland by its cross. The end product is both straightforward and evocative. With just two colors (or, if you think this way, just one color plus white) and a basic shape, so much can be suggested. Mountains. Chalets. Watches. Care and attention to detail. All from such a simple symbol. The efficiency and elegance is, well, very Swiss. 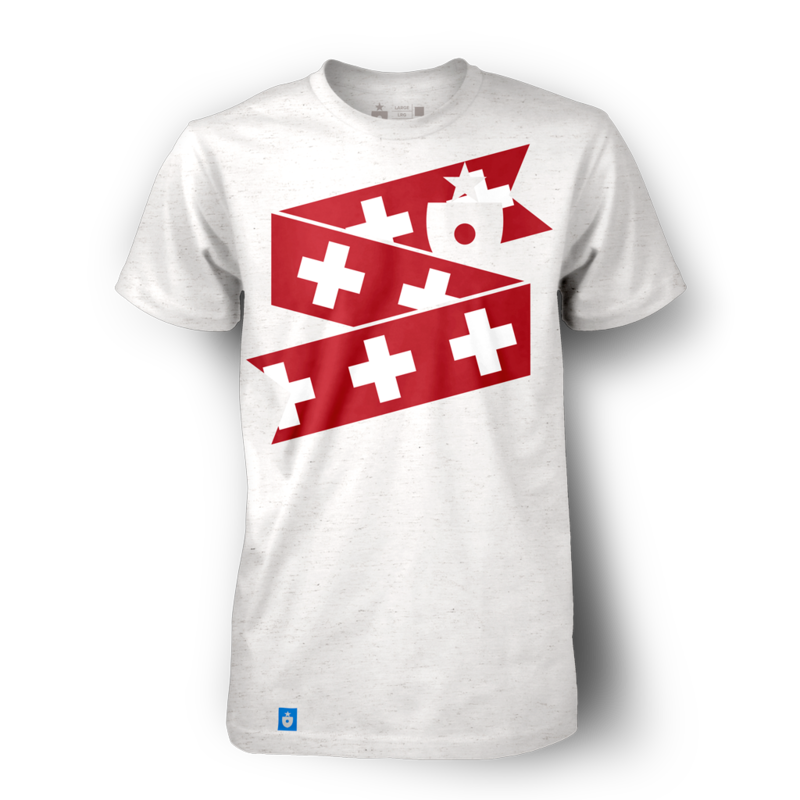 The Switzerland Shirt, by Clean Sheet Co. 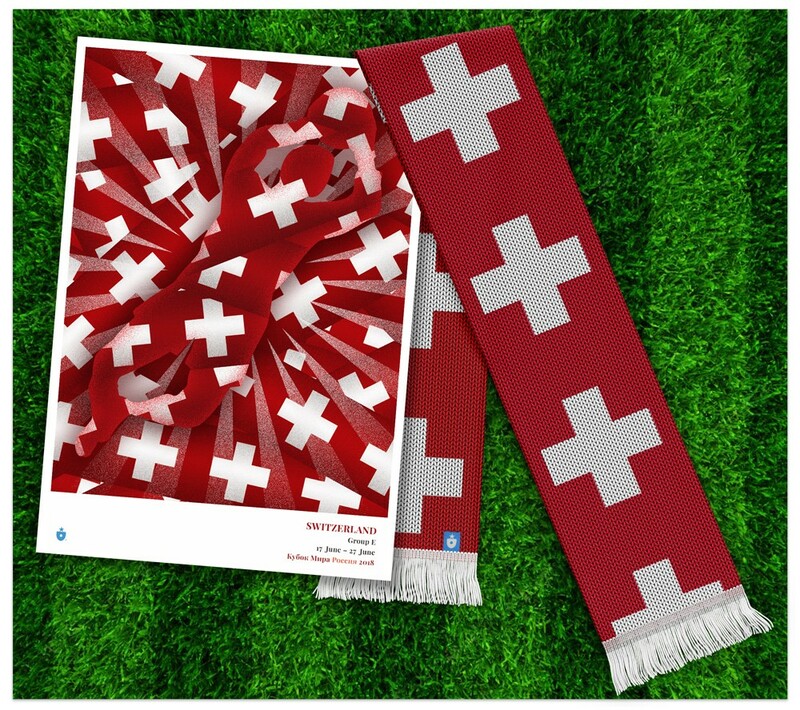 The Switzerland poster & scarf. 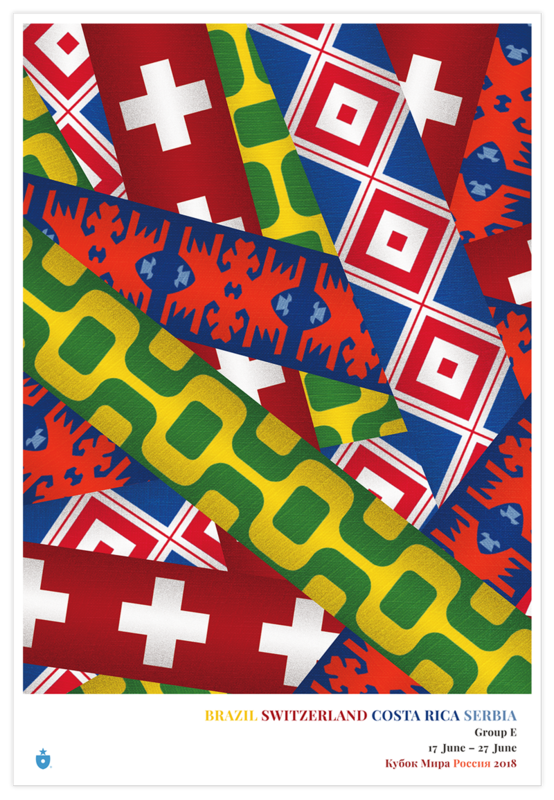 There are other ways to evoke the Swiss national identity, but none so pure as the flag and its beautiful, stoic strength. We’re really pleased at how perfectly the Swiss cross aligned with the Ribbon project. Our dive into Costa Rican symbols led us to a familiar place for this project: textiles. But we got there via coffee. Along with its neighbors in Central and South America, Costa Rica is one of the world’s great coffee producers. Since the coffee bean’s introduction to the country in the late 1700s, its cultivation has come to define Costa Rican agriculture and the lives of many generations of agrarian Costa Ricans. 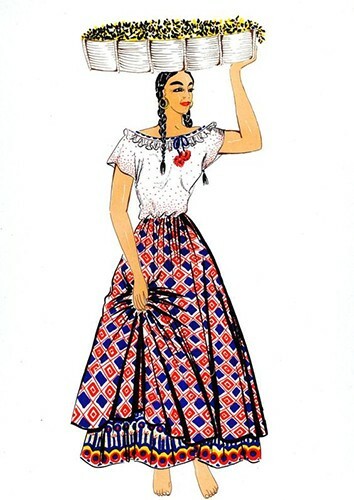 Our ribbon design takes influence from the beautiful textiles worn by traditional coffee cultivators and farm workers. 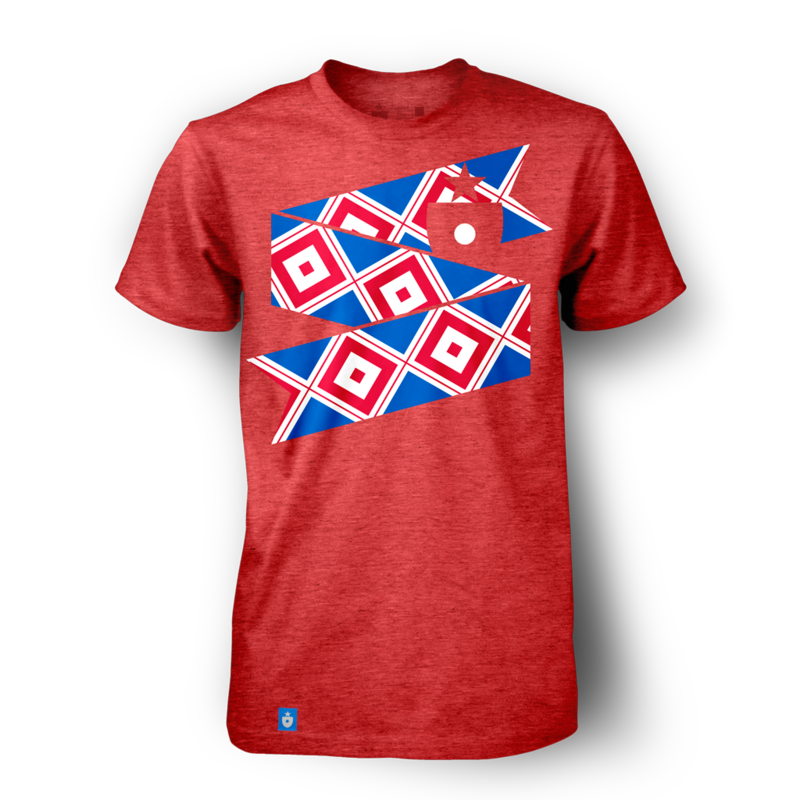 The Costa Rica Shirt, by Clean Sheet Co. The Costa Rica poster & scarf. We’re fans of the North and Central American game — and Costa Rica is one of the standard bearers for our preferred region at the 2018 World Cup. With beautiful, historic inspiration (and perhaps a few cups of extra-caffeinated coffee), we wish them well. So far, our Group E inspirational tally includes national flags, traditional dress and pavement. Let’s keep it diverse. Serbia, what do you have for us? 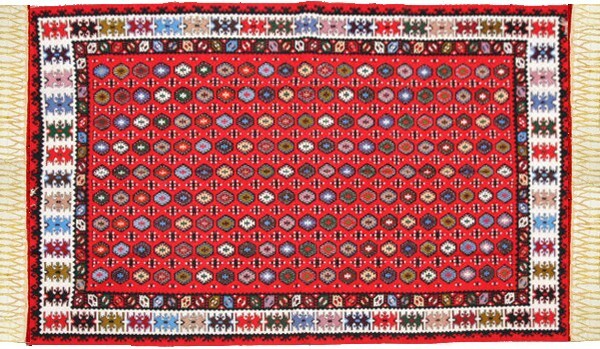 We’ve noticed and taken inspiration from the weavings and tapestries that are part of other national cultures — most notably Iran and Morocco, whose rugmaking is an unquestionable part of national identity. But Serbia has good reason to join those nations — it has a fascinating and visually alluring rugmaking tradition all its own. 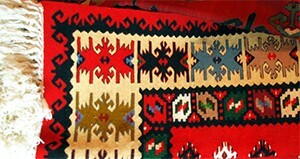 We’re talking specifically here about the Pirot carpet, a distinctive woven rug style found only in the small town of Pirot, Serbia. Once incredibly prominent and sought after throughout Europe and beyond, only a small cadre of dedicated weavers in Pirot keep the tradition alive today. For our ribbon design, we chose to take inspiration from the Pirot carpet — and specifically the shapes that repeat along the carpets’ distinctive border. 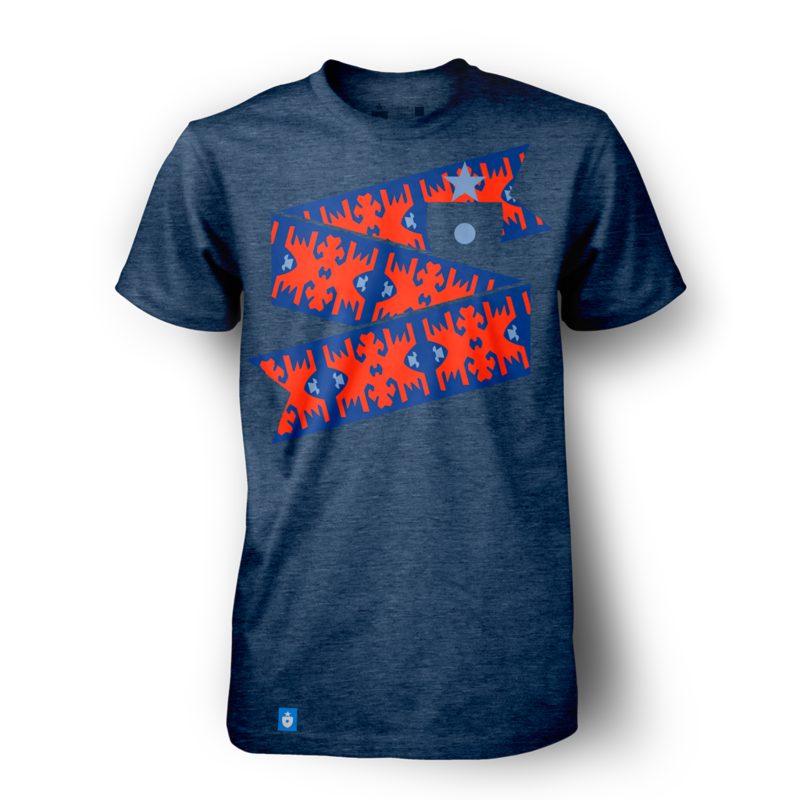 The Serbia Shirt, by Clean Sheet Co. 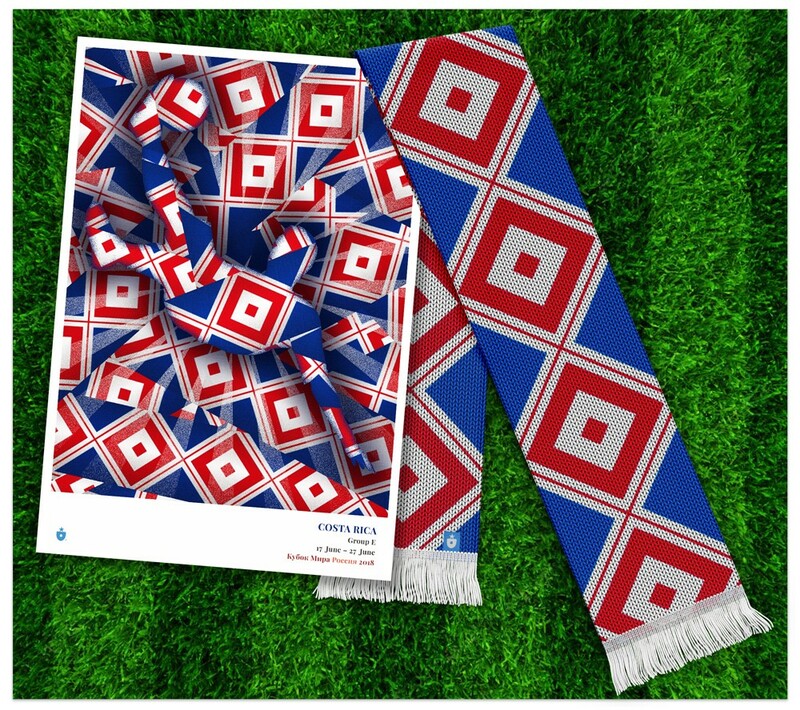 The Serbia poster & scarf. The theme of Group E: traditional elements make for beautiful inspiration—and whether they’re flags or pavement, clothing or carpet, they need to be cherished and cared for so that they can be enjoyed by future generations. Five groups down. Three to go.